On today’s episode of the While She Naps podcast we’re talking about illustration in various forms with my guest, Phoebe Wahl. 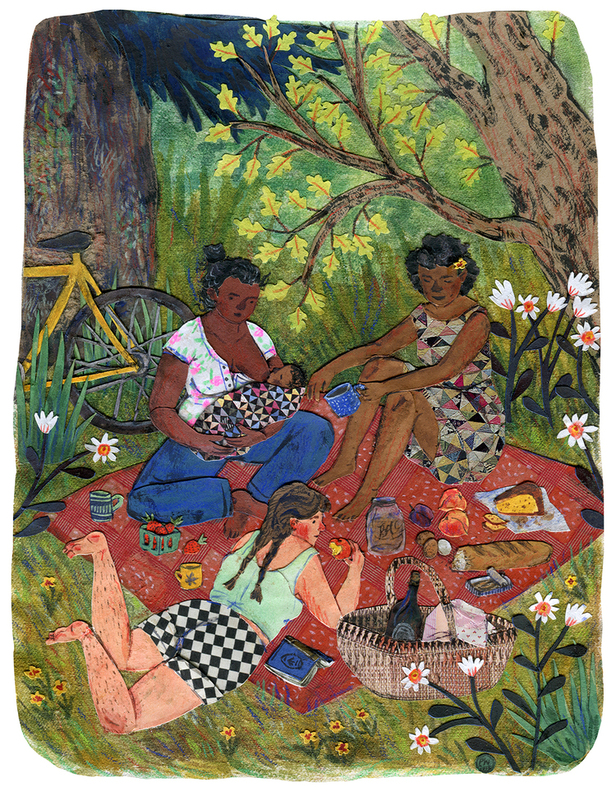 Phoebe Wahl is an illustrator whose vibrant work focuses on themes of comfort, nostalgia and connection to nature and one another. A kindergarten drop-out, Phoebe complained that there “wasn’t enough time to draw” in school. 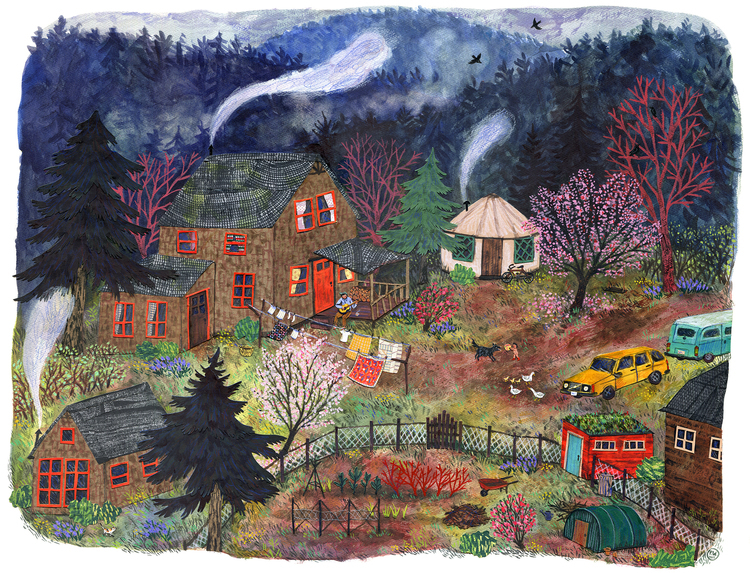 She spent the majority of her childhood running wild in Pacific Northwest backyards, before attending Rhode Island School of Design and graduating with a BFA in Illustration in 2013. 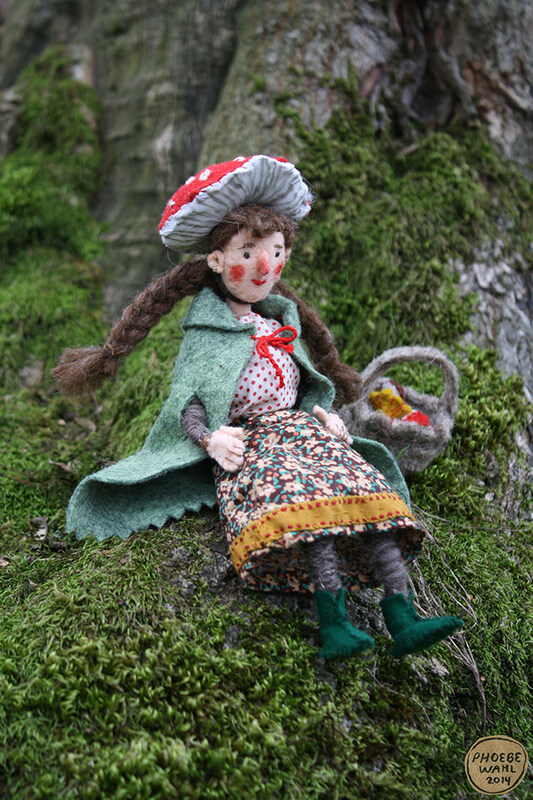 Phoebe works in a variety of mediums, from watercolor and collage to fabric sculpture, an obsession with detail, pattern and texture present throughout. She is a regular contributor to Taproot magazine, and her first children’s book, Sonya’s Chickens (Tundra) was awarded a Kirkus Star. She currently lives in Bellingham, Washington. 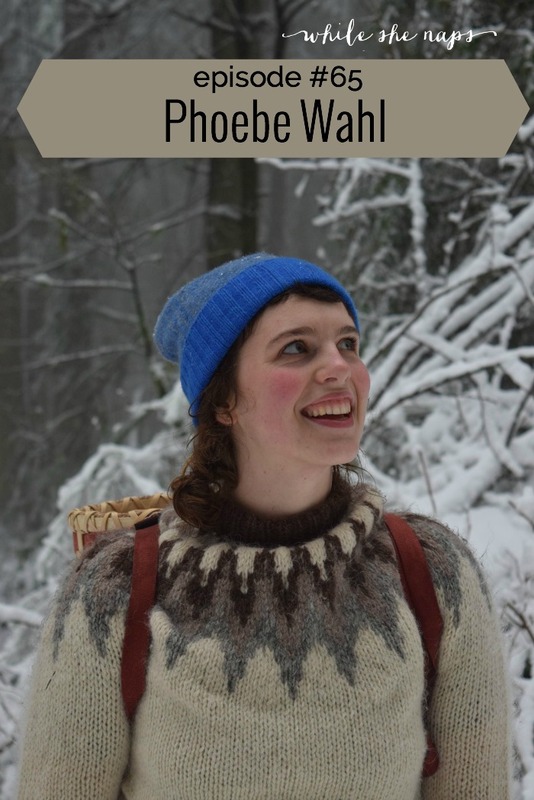 In our conversation we talk about what it means to be “unschooled” and how Phoebe feels this type of childhood shaped her creativity and approach to learning. Phoebe tells about her time at RISD and how she connected with the editor of Taproot, Amanda Blake Soule. 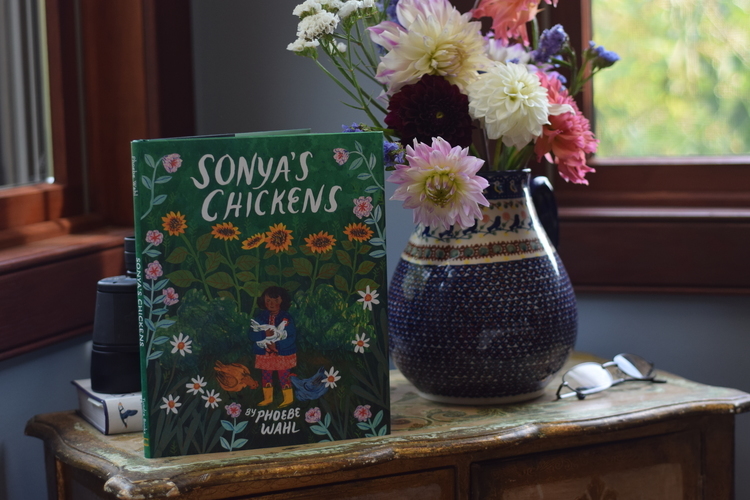 We talk about how Phoebe launched a freelance illustration career right out of college and how she got the book deal for Sonya’s Chickens. Phoebe had an unusual study abroad experience living in an eco-community in Scotland called Findhorn. She explains how this experience shaped her notion of community and the role she’d like to play in the communities she lives in. Phoebe has a very busy Etsy shop where she sells all different things she designs and makes including t-shirts, tote bags, cards, prints, and zines. She explains why she’s still selling on Etsy and her approach to building an online presence (Phoebe began blogging when she was 15!). In particular, we talk about her Feminism is Freedom slogan t-shirts and what that phrase means to her. I also ask Phoebe to talk more about her incredible zine (read it here), Gray Area. Connect with Phoebe on her website or send her a message via Instagram. Today’s episode is sponsored by Spoonflower. 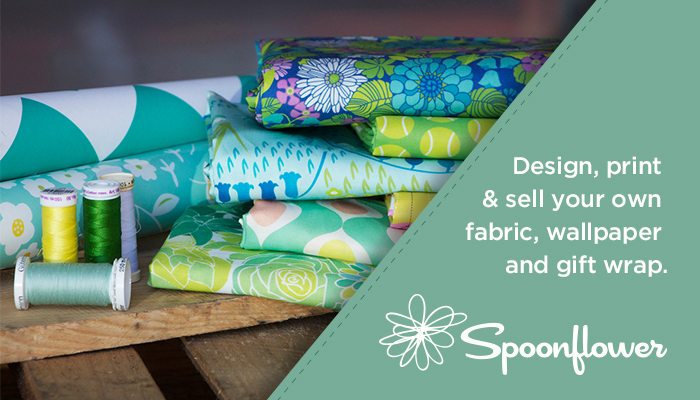 If you feel uninspired when shopping for fabric, wallpaper & gift wrap at big-box chain stores, then you need to check out Spoonflower. When you shop from thousands of designs in the Spoonflower marketplace, you’ll be supporting a talented and devoted artist community, all while maintaining a slim eco-footprint via Spoonflower’s digital, on-demand printing process. While She Naps podcast listeners can get 15% off your next Spoonflower order with code abby15. Learn more at try.spoonflower.com/abby. You can listen to the show right here by clicking on the arrow below, or subscribe in iTunes or Stitcher (perfect for Android or Kindle) and never miss an episode. If you enjoy the show, tell a friend about it! Thank you so much. That was a fun interview! I have collected some of Phoebe’s work in fabric and on paper and it was fun to hear her talk about her process. I also enjoyed the Spoonflower commercial. As a customer–and also as one who has sold on Spoonflower– it was very neat to hear about the printers having names. (One time when a commercial was actually very entertaining!) Thanks for asking good questions and for your podcasts! This means so much. Thank you. I’m really glad you enjoyed Phoebe’s interview. And when I decided to take on podcast sponsors I wanted those spots to also be interesting. I’m really happy you found it to be so! I agree with Helen, your Spoonflower “commercial” was fun! I love to listen to your podcast, just to connect with other makers, and Spoonflower is one of them. It’s funny, the sweater that Pheobe is wearing is the exact one I knitted when I was her age. I’m 56 now, and at that time I had a fluffy black dog, I spun and knit her fur into the pattern. Alas, I was not a very good knitter, and the sweater never fit too good. But I still have it, it’s got my Mava in it! I do love your podcasts; but this one in particular tugged at my heart strings. Phoebe shares her very personal experience with her miscarriage and your discussion about how we each have a reproductive history that we don’t talk about in our day to day conversations with each other. Such a powerful podcast on so many levels. I’m so thankful to Phoebe for sharing her personal experience on your show and for your inclusion of that part of the interview in your podcast. That’s wonderful to hear, Carolyn. Phoebe’s zine really stuck with me. I’m so glad we got a chance to talk about it during the interview. Thank you so much, Abby and Phoebe. I listened to this podcast as I simultaneously fed my 9-month old breakfast and filled out the workflow for my own sewing podcast. All at once, I felt deeply touched, inspired, and called to keep creating content that is true to myself as a maker and a woman. The depth of this interview is incredible. As a retailer and an online content creator, sometimes I worry about offending my audience- I’d be hesitant to mention abortion- despite the fact that I’m personally an advocate of choice and women’s healthcare. I’m reminded that I’m not doing anyone any favors by not being myself (probably that internalized sexism). Thanks again- I can’t wait to hear more of your podcasts, Abby! I’m so glad to hear that this episode was inspiring to you, Mallory. Thank you for listening. Abby, you have a great podcast, but this episode was amazing. It just touched on so much that I’ve been thinking about, or have experienced, or can totally relate to. Phoebe is such a wonderful, deep, grounded person and the conversation you facilitated really brought that out for everyone. It was also a magical combination of things for me… from journaling with your kids, to making art that is a living as well as a passion, and thinking about how feminism can thrive in today’s society. And Phoebe’s zine is so on point… I’m totally one of those women who had a remarkably similar experience, and there really are too few people telling those stories. Thanks for this! Christine, this feedback is the best I could ask for. Thank you for listening and thank you for taking the time to let me know that you connected with our conversation. Making a podcast is wonderful on many levels, but knowing that it affects people is the very best part. I’m so glad to hear that, Kathy!